Sometimes I miss the earlier years of my Dad’s masking career, when there seemed to be more time to do other Mardi Gras-related things besides sewing. I miss the mornings especially. 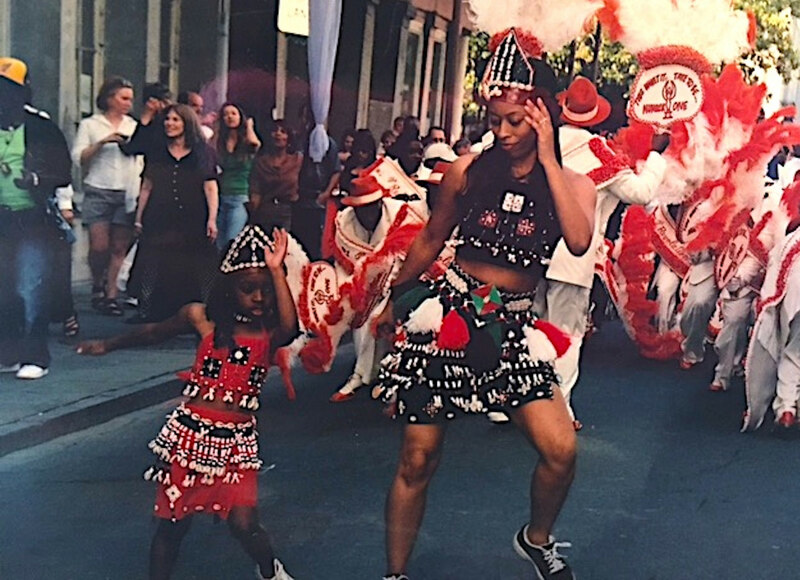 I remember when I was little that my parents would sometimes take me to the Zulu parade on the years that either my Dad wasn’t masking or he could afford to take a short break. Even on years that they were too busy sewing, they’d sometimes send me to parades with other family members or friends, and I’d be dropped off at home sometime afterwards. I was able to see other aspects of Mardi Gras that I wasn’t able to see often, even though they were happening right around the corner. But as I got a bit older, I started to accept the fact that I wouldn’t always get to do the things that everyone else did on Mardi Gras, and I grew to love to seeing the Indians just as much as the parades, so whichever was cool with me. Naturally, the place in which all this work in preparation for Mardi Gras is done has always been just as important as the schedule by which it’s done. It’s changed over the years – coincidentally as the suits have gotten bigger and more complex. Until about six years ago, the main spot for sewing was the living room of our house. People would scurry in and out, leaving trails of sequins, beads and feathers as they went — a mess that would remain scattered around the floor until about springtime. It was a familiar and cozy setting, but not quite as spacious as it needed to be. Now, the whole process of finishing pieces and building the crown happens in the downstairs of my parents’ gallery, Golden Feather. We push the other suits that are on display out of the way for the new one, and add a few long tables to be able to lay everything out. During the whole month of February my Dad likes to cover the windows in order to keep his final result as much of a surprise as possible. The new setting has been working out pretty well. Now, being on North Rampart Street, instead of having to drive from uptown to meet up with everyone else to begin the procession, we can all just walk out the door with Tremé, the I-10 overpass on Claiborne, and all the other areas the downtown Indians pass through, within a short walking distance. The closeness to that entire community makes the process all the more festive, since we’re practically surrounded with parties and parades and merriment throughout the season. Congo Square, the park across the street, is a place that we’ve always frequented throughout the year for festivals and other events (usually involving music). Now it’s so close to us that we can hear the sounds of drums on Sunday mornings and jazz bands on Thursday nights without even crossing the street. There’s never a dull moment around here. Back in elementary school when I was really into photography, Mardi Gras and Super Sunday would be the time in which I would scramble around trying to get good pictures of the suits with my beloved Nikon D40. I’d sometimes get frustrated because there was always so many people around, that I could never get a clear shot without seeing someone’s blurred arm in the corner, or a nosey kid purposely photobombing in the background. It didn’t bother me too much, though, since I really just enjoyed watching the festivities that were happening around me. For whatever reason, I was always very interested, even thoroughly impressed, by the “naturalness” of Mardi Gras. It’s been celebrated in New Orleans for hundreds of years, and almost everyone participating has been doing so their whole lives, so it makes sense that it would be perceived this way. Still, I couldn’t help but marvel at the way in which everything played out so perfectly, and everyone around me seemed to be moving to the beat of the same drum, vibing off of each other and executing actions that they didn’t even have to think about. Elderly bystanders dancing in the street to barroom music blaring from cars without a care in the world, drummers and tambourine players changing rhythms whenever they feel it’s time for something different, photographers bobbing and weaving through the crowd and getting those perfect shots that I, standing at less than five feet tall, was simply too short to be able to replicate. Even the lengthy process in which Indians met with other tribes, proudly showing off their suits and creating chants off the top of their heads before moving on to confront the next tribe position, was done in a way that made it seem like sewing and masking was the easiest thing in the world. On the outskirts of the crowds, I would silently take it all in, snapping photos and never fully participating but appreciating everything that was happening nonetheless. I come from a pretty artsy family. Everyone seems to have several talents that they can just whip out whenever convenient, plus at least one main talent that they use to making a living or some money on the side. For my Mom, that talent is dance; for my Dad, it’s music, drumming to be specific. My sister is also a drummer, and, since getting married, has picked up the guitar as well and is also pretty good at art. Naturally, I dabbled in all of these things throughout my childhood in an attempt to “fit in,” but only really got the hang of anything dance-related, which was totally fine with me. While the act of dancing or playing music can be enjoyable to anyone, there’s nothing like being able to see things from the audience’s perspective. It’s a whole different perspective that my family often misses out on. They don’t ever seem to mind, though.